dual disc brakes and high strength steel fork, you will enjoy a comfortable riding experience. thrills, the ancheer e-mountain with reasonable price delivers on all fronts. Why Own A ancheer Mountain Ebike? LG REMOVABLE BATTERY: With the newest LG 36V 8Ah Lithium-Ion battery, you can reach a range of up to 40 miles per charge. Plenty for a day's adventure or most trips to travel and back. You can charge the battery on/off the ebike by your convenience. No worry for being stolen. HIGH QUALITY MATERIAL: The Aluminum Alloy frame- light, strong and designed to last, makes it easy to maneuver. Aluminum Alloy double-walled rims are for greater durability as well as faster ride with less drag. A high- strength front suspension fork can take your riding comfort to the next level. 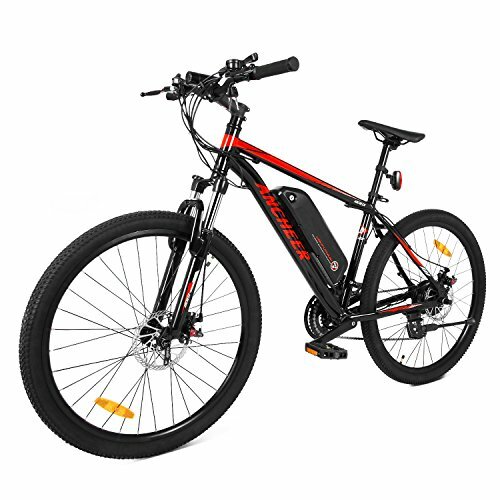 ELECTRIC SYSTEM: This stylish e-bike features a 250W stable brushless motor, resulting in the ability to assist your travel up to 15.5mph. With the LED 3-speed smart meter button, you can choose the electric assist power according to your needs. You can add a burst of speed with the thumb throttle, which is ideal for pulling away from traffic lights. BRAKING& TRANSMISSION SYSTEM: Front and rear mechanical disc brakes Disc brakes for reliable all-weather stopping power. Shimano 21-Speed gear increases hill-climbing power, further range variation, and greater terrain adaptability. COMPREHENSIVE WARRANTY: With two-years warranty for the electric motor, battery and the charger, you've no worry using it. We do our utmost to provide excellent customer service to you.